Power compact (PC) fluorescents, T5 fluorescents, and metal halides (MH) dominate the planted tank hobby. All three are more than adequate for growing plants and all three are a step up from incandescent lighting (which probably won't grow you much more than algae) and regular fluorescents. But in the past decade, a new aquarium lighting technology has been making technological advances that could soon put it above your aquarium. Light emitting diodes (or LEDs) promise a lot of light in a tiny space and all using less energy. So what's the deal with LEDs? Can they grow plants? Are they cheaper/better than the alternatives? Can I buy an LED aquarium fixture? LEDs are seen as the future of aquarium lighting. These aren't the same dim LEDs you'll find in moonlights or household electronics (usually 1 watt or less). The best those can do is "supplemental" lighting. We're talking high powered LEDs, LEDs so bright you can't safely look at them (typically 3 or 4 watts). These LEDs are actually excellent for growing live aquarium plants. Unlike fluorescents, which produce light at a whole handful of wavelengths (some of which may not be useful to plants and actually can cause cyanobacteria and algae to thrive), LEDs can be much more precise and target the exact wavelength of light that plants need, maximizing their efficiency. Therefore, the traditional (and pretty inaccurate) watts per gallon measure can't really be applied. You can get the same results with a much lower wattage of LEDs, saving money on electric bills. But why haven't we seen LED lighting fixtures burst onto the planted aquarium scene if they'd be ideal for growing aquarium plants? Well, primarily, the reason is cost. You can get LED fixtures for growing live plants, but they cost an arm and a leg. And another leg. The 60 inch Solaris LED fixture (now discontinued, but one of the first mainstream LED aquarium fixtures) used to retail for around $3,000. Prices have been coming down a lot lately, but they're still mainly only for the deep pocketed aquarium keeper. If you can afford them though, they seem well worth it. Check out the new epro LumenAqua and the product demo video (below) on YouTube. Go ahead, watch it, it's worth it. I'll wait. Chances are, after watching that, you either bought one (and I'm extremely jealous), or checked under your sofa's cushions, hoping to find a few hundred dollars. We'd all love to have something like that one day right? So why are they so expensive? Mainly because the high intensity aquarium lighting market is so small, and because the technology is still relatively new. It's also advancing at light speed (sorry, pun intended). So for a manufacturer to produce a product that makes a profit with such low volume, it's gotta be expensive. Until the hobby gets much larger (which it will, but it'll take time), or the price of the LEDs drops (which it is), these units will be fairly expensive. Then, there are other issues, like a recent lawsuit that disputes key patents used in LED fixtures for aquariums. These kinds of legal issues can take years to resolve, and in the meantime, the technology is in limbo. While some manufacturers of LED fixtures may be waiting for the lawsuit to blow over, DIY hobbyists are not. Several DIYers have made their own LED lighting fixtures for the planted aquarium using parts purchased online. It's relatively easy, and can be a cheap alternative. However, at anywhere from $4-10 an LED, plus costs for heat dissipation fans and heat sinks, and wiring, and controllers, the larger the aquarium the less feasible this becomes. Right now, DIY LED fixtures for aquariums are best suited for smaller aquariums, where PC, T5, or MH just won't work. So if you're a handy DIY type with a smaller tank or able to spend $1000 on a light fixture, LEDs will work just fine in a planted aquarium. Just be sure you're getting high powered LEDs meant to replace aquarium lighting, and not "supplemental" LED fixtures. But the question remains: Are LEDs right for you? In the next part of the series on LEDs, I'll discuss the pros and cons of LEDs as aquarium lighting to help you better decide whether or not they're right for your aquarium. I bought several puck lights ganged on one low-wattage power adapter and it works great for plants. I used this vendor on ebay who can custom build any setting to your specification. He has round pucks or light bars and many of the pre-made pieces are water-proof and submergible too for accent lighting. I use a mix of the blue/red arrangements for growth and white for general viewing and the cost has been about the same as high-intensity fluorescents. I can't vouch for the wattage of the LEDs but the vendor is very good about communicating. I'd guess he could build anything you wanted. And it's pretty simply to retrofit existing hoods with the LEDs. Low-wattage is easy to wire and relatively safe for hobbyists. The best thing I've found about using LEDs is the directional nature of the light. I have a bowfront tank, nearly two feet deep, but because the light from the LEDs travels in a straight line it penetrates directly to the bottom of the tank without diffusion. It also keeps the light spreading to the glass walls lessening the chance of algae growth on these surfaces. I've noticed much less algae growth in general with no negative effect on plants and wonder if because LED lighting is more wavelength specific algae isn't getting the colors of light it thrives on. Love your site. Keep up the posts! i would love to get a led fixture. first i dont have the money yet. second i want to see how they hold up over time, sure they are supposed to last along time but sometimes manufacturers claims are less then truthful for certain purposes..
Whilst I totally agree with the statements on wavelength of light being narrower for LEDs and therefore much more 'usable' light is given off I can't agree with the 'unusable' light 'causing algae to thrive'. Not true at all. Algae will use the same wavelengths as plants. For algae to be 'thriving' you need to be looking at why that is and not the wavelengths that the light is emitting. more likely you have too much light in the first place and are unable to keep the CO2 sufficiently supplied for the growth rate the plants are being driven at. One reason that LED is quite expensive is that they are/were mainly introduced with the reefer in mind who needs masses of light. The amounts they use consume huge amounts of electricity and therefore when a 75W LED setup can produce 10% more PUR than a 250W MH then it is obvious the advantages. When deciding on the cost you should factor in that the LEDs will last you for 7 years or so compared to 2-3 years with a flourescent tube. Also weigh in that you will need in the region of 33% less wattage to achieve similar lighting levels. The savings over 7 years (with electricity prices rising quickly too) should more than outweigh the initial spend. Andrew: I should have been more specific. Cyanobacteria (blue green algae) has evolved specifically to utilize wavelengths of light that plants do not use. So you are correct, not all algae utilizes these wavelengths, but cyanobacteria has and can be caused by old fluorescent bulbs or bulbs that produce the wrong wavelengths. whats the foreground plant? 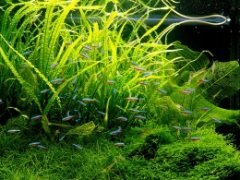 is it dwarf tears(HC)? I don't agree with the above poster. While algae and plants utilize the same light. Algae makes use of pretty much any spectrum of light. Higher plants may grow under many differing lights, but they grow much better under specific spectrums. In addition, some aquariums grow extremely well with very high light levels. Much of this is about finding a balance between light levels (of the right spectrum), CO2 levels, and all other nutrient levels.